In my efforts to have a smoother holiday experience, I'm attempting to plan ahead (I know!) and I need your help. 1. How many presents do you get your children? Ours get something from us, something from Santa, and then their stocking stuffers. It was like that from the beginning, and now that there are five of them, I'm happy that it's already been established. Some of them have things on their list that don't cost as much, so instead of one $50 present from Mom & Dad, they might get five $10 presents. This caused some wailing and gnashing of teeth last year, as the present piles were distributed. This year I'm thinking of maybe wrapping all the little things in a big box so each one has the same amount of things to unwrap, although there still will be comparisons made once they were opened. 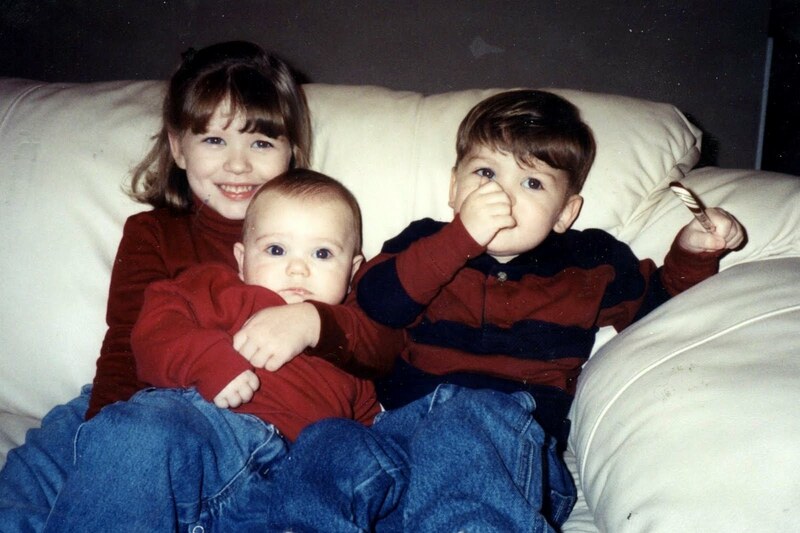 Christmas 2000: Sierra 3, Brendan 2, Jordan 6 months. 2. If one sibling buys a present for another sibling, do they have to get something for all the rest too? Again, the comparison monster showed up, with his posse of that's-not-fair and how-come-everybody-likes-them-the-best. Should it be all or none? 3. Do you wrap the gifts as you get them, or have one big day where you wrap them all? Between teachers and bus drivers and friends and family, it seems like there is wrapping crap all over this house for the whole month of December. Last year I put it all in a rubbermaid container, so at least I could bring it in and out of the garage, but does anybody have a better system that works for them? I come from a family of seven kids (we're age 26 to 6) and I know how crazy Christmas morning can get! In our family, the little ones usually had multiple smaller gifts and the larger, more expensive gifts usually started after we all knew the truth about Santa and could understand the cost vs. quantity. As far as siblings gifts goes, we used to all get each other a gift, but that got a little expensive if Mom was helping out the little ones. Now we draw names on Thanksgiving. Each kid gets one other sibling to buy for. And there are no arguments. We also all open gifts at the same time - no taking turns, so it's not as obvious who has a couple more gifts. We always had a sibling exchange. Six kids. Makes sense. We still do it today. Same rotation. Oooo, hard. We're just getting to the quantity vs high cost problem. I think they will understand this year, we plan on talking about that as we ask for their wish list. We did a sibling gift exchange last year and had them draw names. We'll do the same this year. And then wrapping as you go...tried that once. I wrote in teeny tiny writing somewhere on the gift what it was and for whom, but for some reason couldn't find the writing on many of them when it came time to label them and put them under the tree. So I had to open them to see. The last few years I've just bitten the bullet and done them all on Christmas Eve. There's just no way you're going to bed at a decent hour that night, so...I wrap, Darron assembles. we spend approx the same amount on each kid. AND each kid gets the same amount of gifts to unwrap. (except the baby. he gets less than everyone else because he still doesn't quite get it.) it is the great organizing nightmare with all my hidden lists and receipts. the kids exchange names so there will be no contention there. we take everyone to the dollar store together and everyone picks out a gift for their person. mom and dad pay for all the gifts. big spenders, i know. as far as wrapping the gifts... i try to have all the gifts purchased by the 1st week of december so we can wrap everything at once. in the past, jeremy has taken a day off of work for this event. we set up a wrapping station for each of us and go to it! we turn on a christmas movie or 2 and drink hot cocoa until it's all done. it's quite the fun tradition actually. 1. It depends. We usually spend maybe $50-$80 on each kid, so it depends on what gifts they want. I don't think we'll be spending even that much this year. The only thing Yaya wants is a $10 Nerf gun and Mr. Man doesn't care. They get so many gifts from everyone else that I don't think they feel shorted if they only get a few gifts from us, and with the way the toy room looks (and the fact that my mom still has a room full of their toys) I'm not inclined to buy them toys just to get to a certain number. And yes, I am totally trying to justify being cheap. 2. Yes. I grew up in a family of five kids and even today we wouldn't get one sibling a present without getting the others a present. (We don't do sibling gifts, and we draw names for the kids.) It was never even considered as an option and I doubt my mom would have allowed it. 3. I would probably wrap one or two things ahead of time, get lazy and then do them all at once on the 23rd or 24th. I'd put everything in the basement until I'm ready to wrap it, probably in a big tub like you, then I'd bring them to the living room after the kids were asleep so I could watch TV and wrap at the same time. I usually try to give the same number of gifts. My kids are too young to know what things cost, so I don't have to worry about that quite yet. We also did a gift exchange growing up, and I think I'm going to start that with my family this year. 1. I do both-- I try to be even on price and number of gifts. This doesn't matter with my kids (4 years old and 15 months), but it will matter soon, and it just makes good sense to start now. My husband makes me budget for Christmas, so I actually try to do this with everyone on my Christmas list. 2. this question does not apply to my world, so I'm going to skip it. But I will say that all the presents we give to adults (my dad, my brother, etc) are from the kids. I haven't given a gift that's from me in five years! 3. I have a wrap day! It's too hard to keep getting the wrapping stuff out and putting it away for each gift-- it's easier to do it all at once! If a kid buys for a sibling, then all siblings get something. My husband and I count boxes, not items. We match money as best as possible. Santa brings 1 big item. (or a couple,3 small items) When Jenna was young, only child, and I had $$$ she got EVERYTHING. It was ridiculous. She has been a really good sport about not getting as much. We get her what she really wants and forget the fluff. Our girls are 8 and 2 so the baby is oblivious and the 8 year old understands that her stuff costs more. We tell her we have to pay Santa to cover that end. Hope this helps- Trust me- prepare NOW and enjoy the holidays. You can thank me by sending me a corsetted apron. - I always make sure everyone has the same number, to my kids that's more important than price. They generally get their stockings stuffed, then three other presents - one "bigger" (the bigger depends on the child, but generally still under $20) and two smaller. - We do a sibling exchange, as I did when I was a kid. Names get drawn and they pick a present. We give them a dollar amount and if they want to spend more they have to use their own money. - I always dream about wrapping early, and once did, and had the same problem as Heather - I forgot what everything was. So now I usually spend a night wrapping in front of a movie a few days before Christmas. 1. I try to give my 4 kids the same amount of gifts. I've given them socks & undies for years and now that they're teenagers it's good for a laugh. They usually end up with a few small, and one expensive gift. 2. The 6 of us all draw names and split up at Walmart with our $5 or $10 (whatever we decide on). The kids use their own money and we open these on Christmas Eve. 3. I try to wrap as I go, but always end up with a big pile a few days before Christmas. 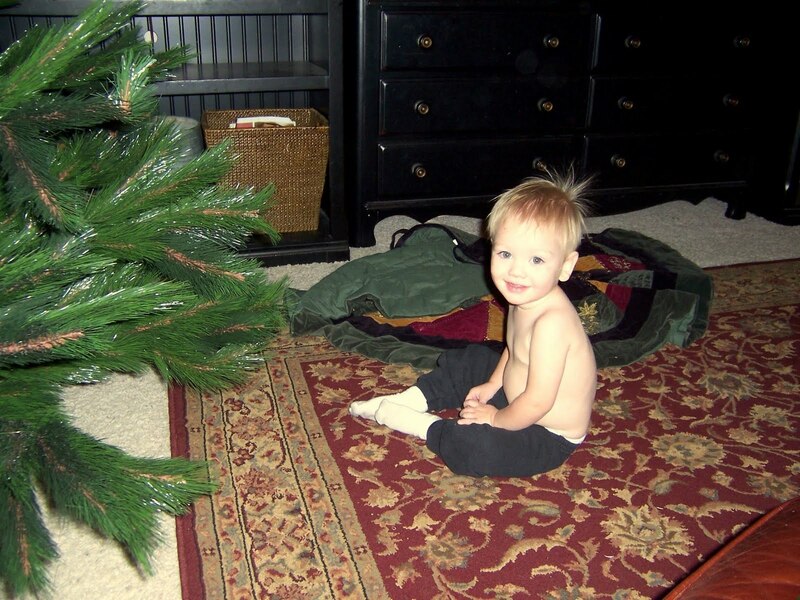 We started something new a few years ago after our youngest was in on the "santa secret". Each kid has their own wrapping paper. It's brilliant because I don't need tags plus it's fun and easy for the kids to anticipate/count their gifts. Does your Costco (dang it I forgot you never go there) have the bronze reindeer? Kennedy spotted them yesterday and was in love. Life sized bronze statues... you can guess how cheap they were not. "Mom, I NEED that for Christmas!" I get my kids 3 gifts and have for years. The baby Jesus got the gifts so... so do my kids. Santa always brought the stocking. And yes I spend the same amount, mine are older now so it's easier if everything isn't so even. I go big on stockings, it's our favorite part. My stocking usually have a theme, like maybe a color (meaning everything I buy is orange for that stocking" It usually has something to do with what they are into that year. I can make up any cost on gifts with what I buy there. One of my gifts is always something very meaningful, not something on the "wish list". I wrap most of mine all at one time about a week before Christmas. As for not fair... "life isn't fair" hard lesson but true! Good luck on getting a jump start! Oh - I am so not ready for this year and these questions show it. We spend the same $$ for each child, and I kind of ignore their wish lists. I wrap throughout the season - whenever I get a chance where there are no kids around. My closet usually seems to be the spot where the wrapping paper stays all season long and I just step over it. Our kids get 3 gifts from us because Jesus got 3 gifts. Santa also brings 3 gifts (very small/inexpensive), and fills the stocking. My kids are still into Santa. Its hard in our neighborhood (there's a lot of $$ and we lack that). All their friends get BIG and Pricey gifts from Santa. We tell the kids that Santa has allotted so much dollar value per kid in the world. If he brings more than that amount, the he sends the parents a bill. We have our kids draw names. Santa brings our kids 3 presents, because Jesus got 3 presents. I have also heard that some families give 4 presents, one you want, one you read, one you wear and one you need- I always thought that was cute. I wrap them all as soon as I buy them, and each kid gets their own wrapping paper, the other ones get bows and tags, and get placed under the tree as soon as possible. We don't focus on the price of the gifts yet, our kids are still to little to ask for anything that costs more than $10. As for gift exchange, we draw names with extended family. Immediate family we shop together (Mom, Dad and child) to pick out one present for the other kids. It's fun to spend one on one time together with the kids, and makes them feel the spirit of giving. So, for us, always wrap the night before. Just happens. I want some cheap ideas for teachers/drivers/neighbor gifts. Rebecca, can you please get that post started? Thanks! We always have Christmas with my parents and they do the bulk of the buying. I try to buy one item for each of my older kids that says "from Mom and Dad" on it, so they know we're part of it, and I buy stocking items, but they're pretty minor. I'd say I spend less than 20 per kid. My parents just say the majority of the stuff from them is from Santa. It's incredibly nice of them, but sometimes I think I'd like to do Christmas myself for my own kids....someday. The kids each get one gift from their siblings. I have four kids, so it's from three of them to the other. We discuss what they'd like to get and then I usually buy it when I'm out and about and then they wrap it. So far it's worked pretty well. Wrapping bites. Since we often travel, prewrapped gifts end up all smushed or torn, so now I end up doing almost all of it on Christmas Eve. If we're home, I wrap as I get the stuff. I have those underbed bins full of wrapping supplies and just pull them in and out as needed. Glad that's past for us. Now it's the grandkids. The grownups draw names, and we get a gift for the grandchildren. There's only 2 of us, we get maybe four moderate-small gifts from 'Santa' and the same under the tree, plus a few stocking fillers. Stocking fillers are kinda cheap. Either fruit or stuff we'll need throughout the year anyway, like pens/pencils for school or socks/luggage tags. And maybe one big gift for both of us under the tree, partially dependent on price of small gifts. Last year I got a luggage tag, a fountain pen, an orange, an alarm clock, a 3d puzzle, a mini maze and we got a mini air hockey table between us.